Concerns language. 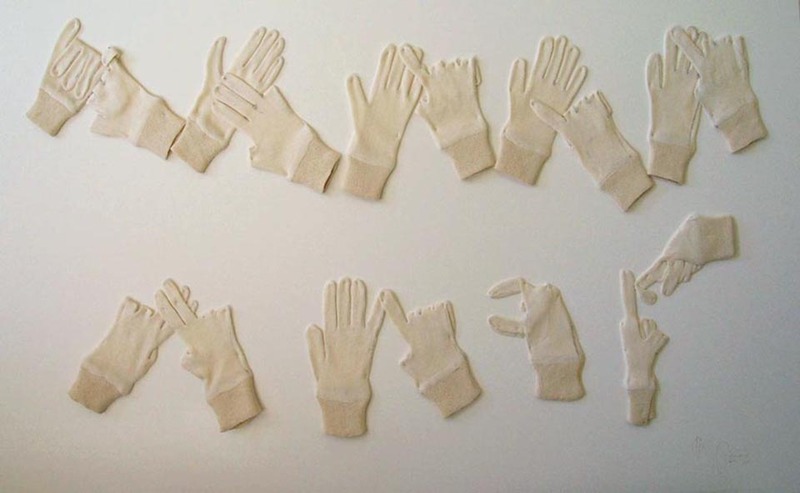 The language of art and BSL (British Sign Language). Next to English, the language I use and need most, but not offered as part of my compulsory state education that forced oral and European options only. The starting point for the work was buried in my subconscious, from poetry and time past. C'est la vie. This work has been described as a self-portrait. 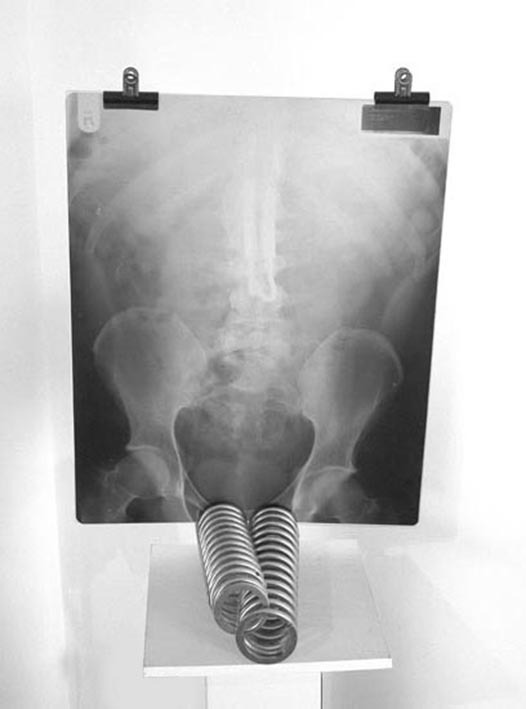 It is an assemblage of my spinal X-ray and the stainless steel springs inserted by surgeons, following a motor cycle accident. The interlocked springs are from the suspension system of a motor cycle. The work is about a return to life. 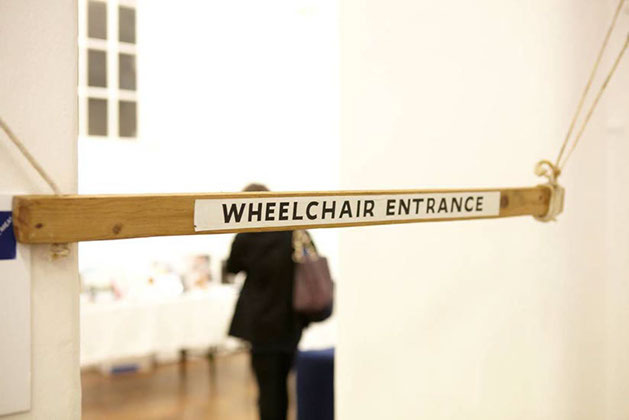 ‘Wheelchair Entrance’ sculpture/Intervention (1989) – timber 28”x2”x1” lettered with the words, ‘Wheelchair Entrance’ with two hanging ropes. 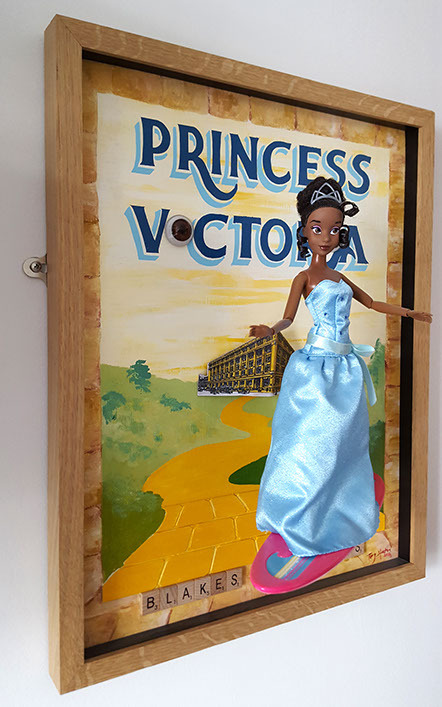 The piece is designed to hang in a doorway at a height that will impede ambulant people but give clear access underneath it to wheelchair users. Tony Heaton: Breathe Nothing of Slaughter from Xenoki on Vimeo. 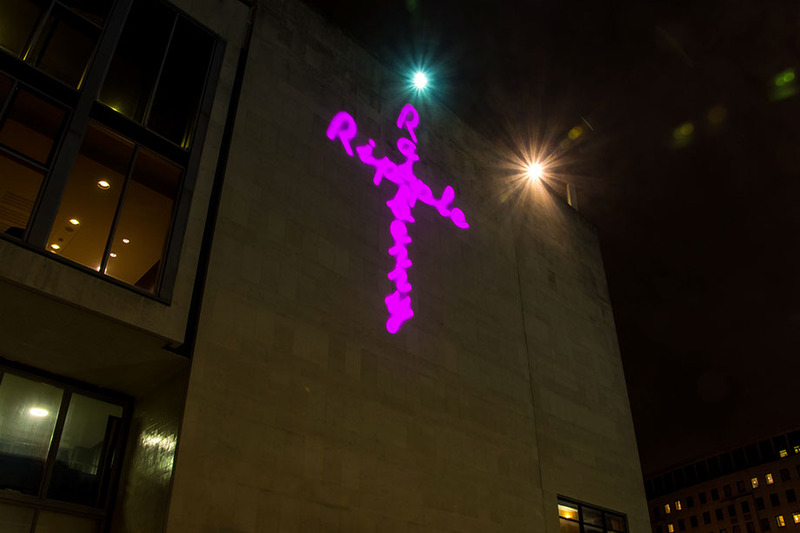 I examine the potent symbol of the war memorial and the reality of war. Heroic, Adonis-like bodies are set in stark contrast to images of blackened faces and malnourished and broken bodies. In this series of short films, five contemporary disabled artists present warm, witty and poignant perspectives on war and disability. From a cast of animated disabled soldiers to a chaotic WW1 hospital and the heroic figures depicted on war memorials, these films offer unorthodox, irreverent and unexpected takes on the legacies of war and disability in Britain today, taking inspiration from Siegfried Sassoon’s 1917 poem Does It Matter? sculptural objects hold a prominent place in our civic life and act as a collective public memory. The reality, malnourished bodies, broken, faces blackened, feet rotting, limbs protruding from bomb shattered earth, horrific, grotesque. This film explores the detail of the memorial, intercut with photographs of soldiers on the front, including the fallen and those disabled by the devastating effects of war. “The sculptor has endeavoured to conceive a memorial that shall breathe nothing of slaughter, but only of duty fulfilled.” Pamphlet on the unveiling of the Burnley War Memorial, 1926.
guilt/sense of superiority, by ‘giving’ to disabled people through charity appeals rather than through social justice and rights. Heaton asserts that the typical couch-potato Telethoner isn’t stirred to any meaningful action even if s/he is ‘shaken’ by the supposedly harrowing images of begging and drooling crips. A short film of Heaton’s performance was shown on Channel 4 and photographs of it were published in The Observer (see article here) (July 12th 1992).Around 2000 protestors circled the LWT building on the South Bank whilst the 1992 telethon was underway and a few people infiltrated the studio to shout slogans (‘Rights Not Charity’, ‘Piss On Pity’ etc) at the show’s compere, Michael Aspel. The 1992 ITV Telethon was the last one. 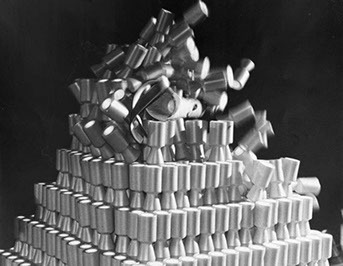 Note:(1) An interesting, ironic aside is that, having located a manufacturer of disability collecting cans, Heaton was not able to persuade the firm to charitably donate so many of them to his sculpture. 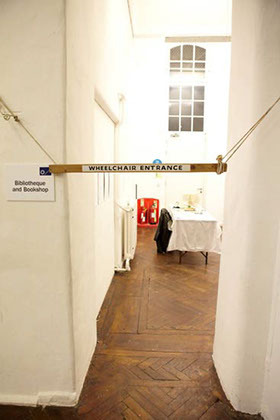 It was only through the provision of an Arts Council grant (i.e. 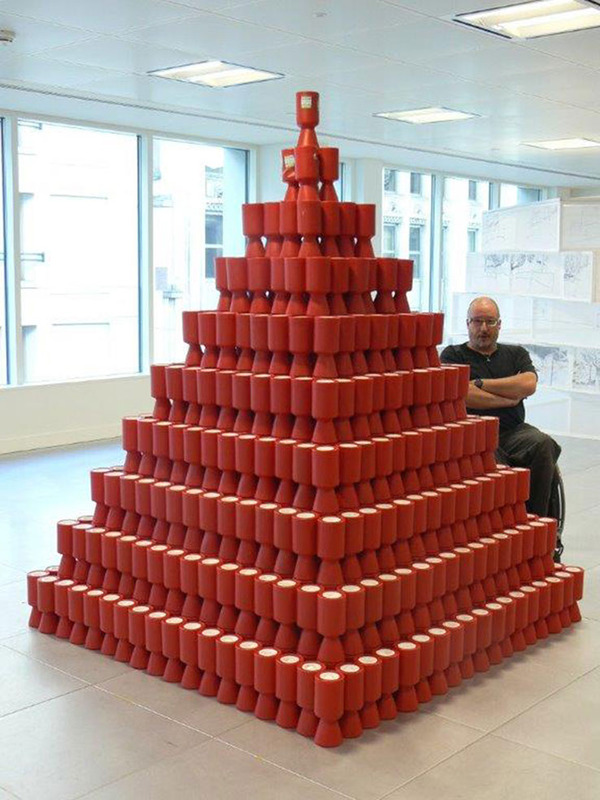 legitimate or‘ meretricious’ social funding) that he was able to purchase the cans -with no charitable discount – for £2,000. LADA (Live Art Development Agency) study room guides by Aaron Williamson has an article on my 'Shaken not stirred' performance piece. Diorama Arts Centre, London, 1992 This was a protest performance staged at a press conference designed to register disabled people’s opposition to ITV’s charity Telethon. There were three ITV Telethons: in 1988, 1990 and 1992 each taking over the entire network for more than 24 hours and raising many millions of pounds through phoned-in credit card donations. By the time of the1992 Telethon an umbrella organisation ‘Block Telethon’ had been formed by over eighty disability groups. The main thrust of the protest was that disabled people need social rights rather than charity. 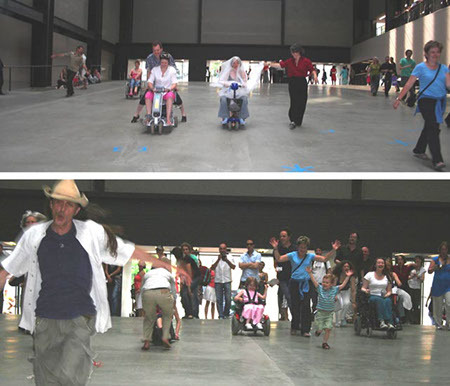 This is a performance piece called 'Ro-Tate' performed in the Turbine Hall in Tate Modern as part of Architecture InsideOut. 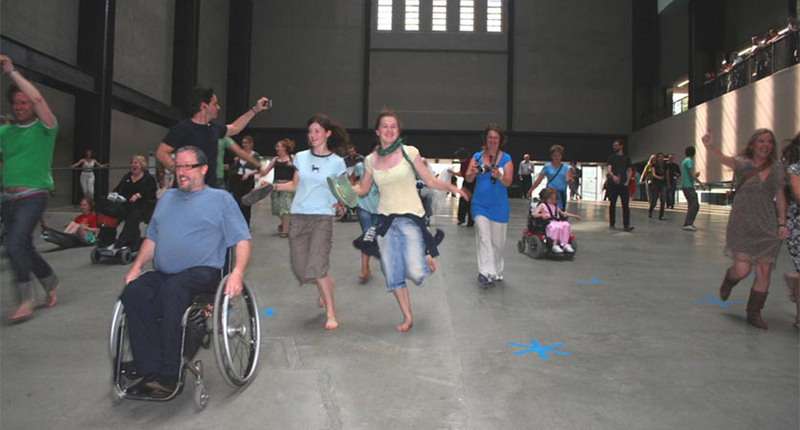 I asked 100 people to go from the top to the bottom of the ramp in the Turbine hall by any means other than walking. 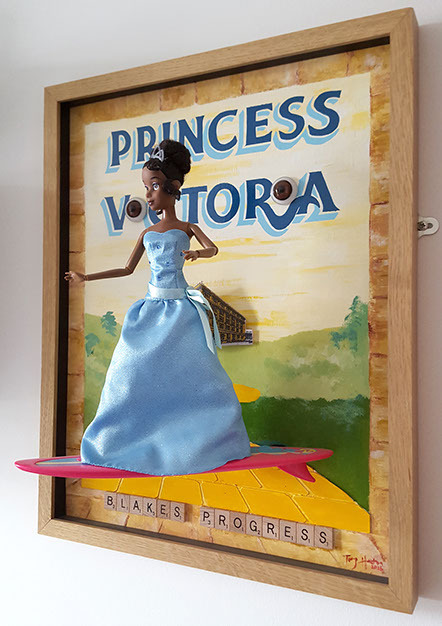 Mixed media - enamel on board, glass eyes, Princess Tiana doll, surfboard, wooden tiles, card. 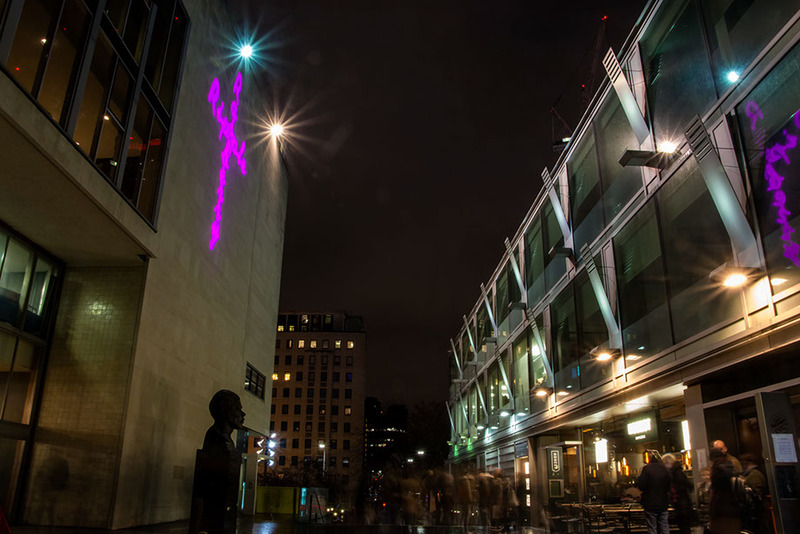 This work is a commissioned piece by Graeae Theatre. Reframing the Myth brought together creative people from different spheres to create new works of visual art. 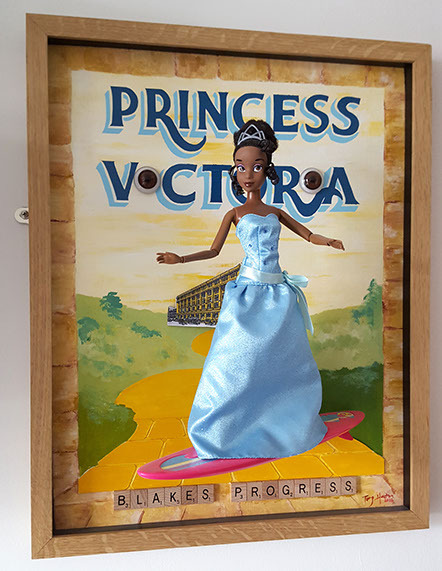 I wanted to replace the letter ‘I’s in the word Victoria with glass eyes, I was worried about her thinking that this bit of subversion would be offensive but she laughed loudly! It was also important to have tactile elements within the piece. Performance. 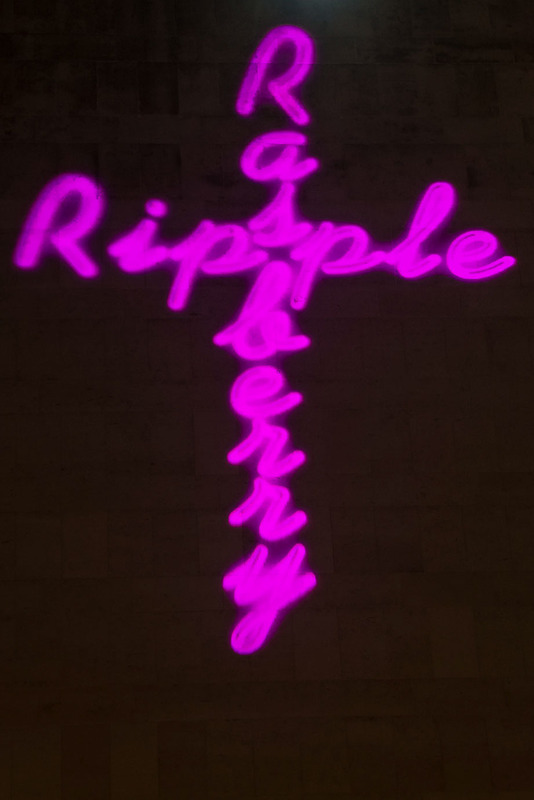 Tate Modern Turbine Hall.